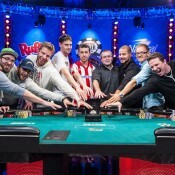 The final table is set for the 2011 EPT London. Leading the way is Martin Adeniya, with 4,736,000. Adeniya isn’t well-known, but has been grinding out cashes like a British Dwyte PilgrimTM for the past two years. In related news, Adeniya is the only Brit at the final table. 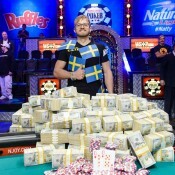 Adeniya is followed by Mattias Bergstrom with 3,620,000. Day 2 chip leader, Benny Spindler, has remained near the leaderboard all tournament, and is third overall with 3,435,000. U.S. American Kevin Iacofano (2,685,000), Juan Manuel Pastor (1,915,000), and U.S. American Steve O’Dwyer (1,250,000) also remain.